Although officially termed the Huntsman Spider, this incredibly large arachnid is often called a banana spider because that is how it has often been brought into the U.S. – in crates of bananas. Because of its size and the way its long, hairy legs point forward, it is also sometimes called a giant crab spider. This Huntsman Spider is thought to have originated in Australia, and though it is not native to the U.S., it has become established in some southern, subtropical areas of the country. It is still not overly common to most of the U.S., but it may be found virtually anywhere that bananas – or other imports – have been shipped. In southern states, such as Florida, Texas, and California, this spider has adapted to its new land with populations becoming quite common in some areas, especially in avocado groves. According to a University of Florida fact sheet, the spider cannot survive freezing temperatures, so it is less likely to breed in the northern states, unless it is able to become established indoors, especially in greenhouses or other heated buildings. In its native land of Australia, there are almost 100 described species of Huntsman spiders, with some often being confused with tarantulas because of their large size. It is often found living outdoors beneath rocks, logs, and other ground debris, as well as behind the bark of trees. In both Australia and the U.S., it is not uncommon for the huntsman spider to enter automobiles for shelter, hiding behind sun visors, inside dashboards, etc. - then suddenly emerging to startle drivers and occupants. Legs are long, up to 3 to 5 inches long. The coloring is a brown, fairly solid color with little patterning (with variation among species). Variation between sexes means that the female spider has a larger body, but the male has longer legs. Personality is shy, with a tendency to avoid human interaction. The bite of the Huntsman spider can be painful, but it is not poisonous. However because this spider is sometimes confused with the armed spider of Brazil or the large brown recluse, both of which do have a deadly bite, the Huntsman is sometimes thought to be dangerous. It can be differentiated from the brown recluse by the violin marking on the 3/8-inch-long body of the brown recluse. Neither the Huntsman nor the brown recluse is usually aggressive, but if either is disturbed or handled, it may bite. The Huntsman spider is quite interestingly described by Knight Science Journalism at Massachusetts Institute of Technology MIT as: "With hairy chins, eight bulbous eyes, almost comically meaty fangs, and delicate pedipalps, the large, fleet-footed arachnids known as Huntsman or giant crab spiders are a memorable and lively bunch." As are many spiders, the Huntsman spider can be a beneficial insect because it preys and feeds upon other insect pests, such as cockroaches. There are other species of Huntsman spiders, such as the Rain spider of Africa. This spider is differentiated by its plump body. As described by Africa Travel Expert Anouk Zijlma, "While they can bite, their venom is relatively weak and a human will recover in a matter of days. The females will get very aggressive while defending their eggs. Rain Spiders hunt at night and sleep during the day. They're called Rain Spiders in Southern Africa because they tend to be more active just before and after it rains." 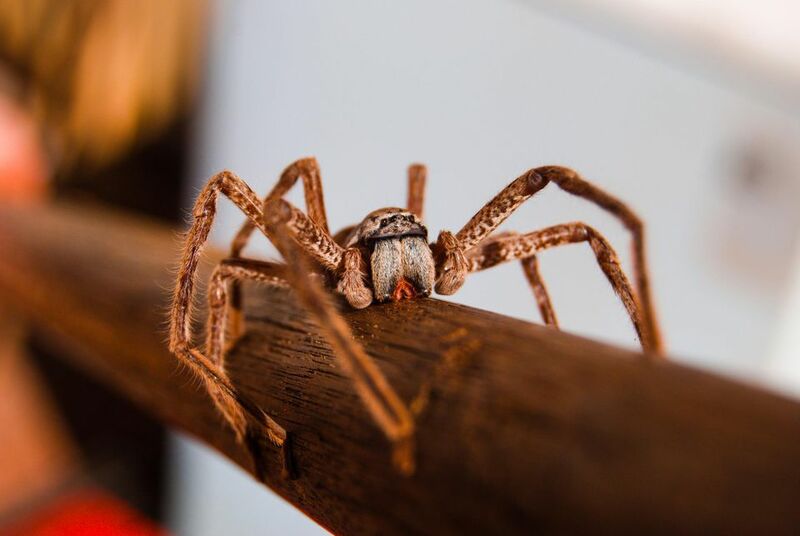 Control of the Huntsman spider is similar to control of other spiders in and around the home with preventive sanitation and exclusion as the primary means of control, and chemical means useful primarily if the spiders occur in large numbers. Because spiders feed on other insects, reducing and eliminating all insects will also help to reduce and eliminate spiders in and around the home.